In Asia, he was widely known as “THE” best suona player. Guo graduated from the top music school in China – Central Conservatory of Music. After graduation, he was invited to stay on as a lecturer. He taught suona at the conservatory for 9 years. In 1999, he became the principal suona of the Hong Kong Chinese Orchestra. Guo significantly contributed to the suona history with his invention of the “Flexible Core of the Suona”. It solves the problem of playing complicated modulations and temporary inflexions on the suona. This invention allows suona, a folk instrument, to play with large-scale national symphony orchestras that use more sophisticated and modern arrangements, thus greatly broadening the expression of the instrument. 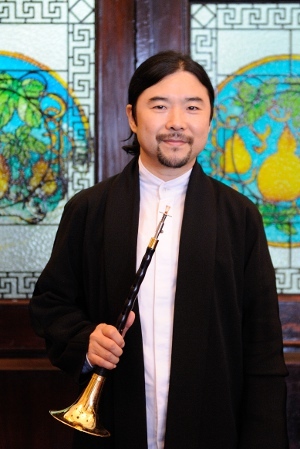 As one of the most outstanding players in the orchestra, Guo has attended many important performances on behalf of the orchestra. Guo is a versatile and charismatic player. Apart from the suona, he can also play pipe, sheng, piccolo, flute, ocarina, cucurbit flute, saxophone and even ‘leaf’. In 1998, he performed at the welcoming banquet for President Clinton’s visit to Beijing. In April 2007, the Hong Kong Chinese Orchestra held a large-scale personal solo concert titled “Guo Yazhi’s Wind Music World – Legend of Suona” for Guo in the Hong Kong Cultural Centre Concert Hall. It was a sold-out performance in a 1700-seat concert hall! He played several kinds of musical instruments and his performance brought great surprise and enjoyment to the audience. The performance was a great success! In July 2012, the orchestra held another personal concert titled “Guo Yazhi’s Wind Music World 2 – Raising the Bridal Sedan and Welcoming the Bride” for him. Chinese opera, modern jazz elements and diversified playing forms were introduced into the performance, showing his excellent music talent and deep expression of music. Guo has performed many times on CCTV’s programs. His personal charm has attracted a large group of music fans in China, Hong Kong and Taiwan, and has changed people’s attitude towards the suona. Many students chose to learn this musical instrument after viewing his performance and he has enabled this traditional musical instrument to become fashionable and modern.